Happy Monday loves! New week, new hair. 😉 Last week I dyed my hair with Garnier for a fun feature coming out in Style Watch. Can’t wait to share more on that later. I have not dyed my hair in awhile and truthfully I was beginning to really love my dark locks. I kept an open mind though and was totally up for something new, just as long as it wasn’t blonde! Initially I was not sure how I felt about the color, but I have to admit that now I really love it. I think it was the perfect change for me. What do you think? I also curled my short hair for the first time over the weekend thanks to a new wand with different sized barrels. I got a few questions about how I did it on social media, so I definitely need to do a new beauty post on this soon. I’ve totally been slacking in the beauty post department, but that’s mostly because I want to create a better space for shooting those photos. Ok, now on to this look! It was a surprising 60 degrees on Saturday so I took complete advantage and shot two spring inspired outfits. Felt good to take the coat and layers off, even if only for a weekend. This look is super simple, but I loved the color play with different shades of neutrals. Lighter colors instantly make me thing of spring and warmer weather. Ahhh, we are getting so close to it too! You can never go wrong with a good pair of ripped denim and a cozy knit. I’ve already worn this white sweater multiple times since I got it before my trip to Sweden. And speaking of Sweden, I am so happy I bought this hat at the H&M there! I can’t seem to find it on the website and haven’t seen it yet at the store near me. It’s quickly become my new favorite. I don’t even know how or when my hat obsession formed, but my collection is continuously growing. I’m all about incorporating them into my outfits every season. Pretty look! 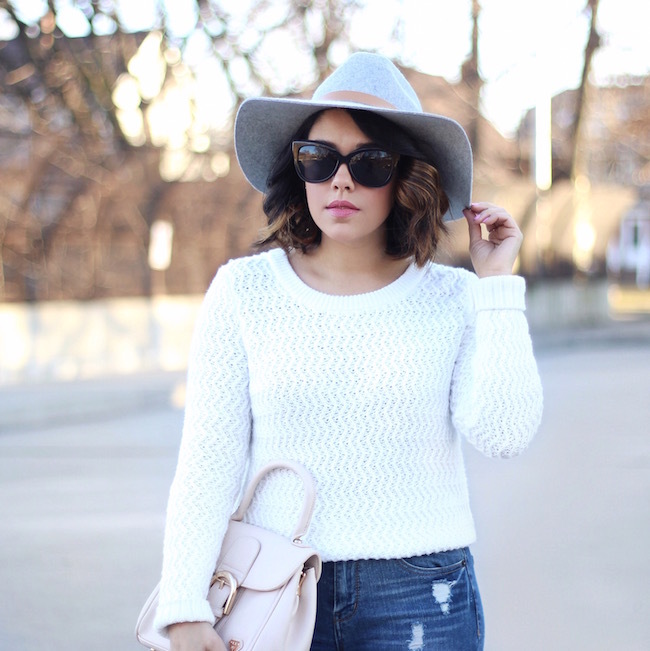 Love your white sweater and hat! Your hair looks beautiful! I love the new color. Great look too, loving these jeans!